Humble, charming little Wales is a land of lusty men's choirs, salty harbors, slate-roofed villages, stunning mountains, and stout castles. For many travelers, these mighty castles alone are reason enough to visit, and Wales is slathered with them. During the late 13th and early 14th centuries, English King Edward I started building these awe-inspiring fortresses — arguably the most breathtaking you'll find anywhere in Europe — to subdue the rebellious Welsh. These castles were masterpieces of medieval engineering, built with state-of-the-art castle technology, with sea access to restock from England. In the Middle Ages, the standard castle was a simple stone building ("keep") on a hill ("motte"), surrounded by a wall that enclosed a yard (or "bailey") where the people lived. This mound-and-yard ("motte-and-bailey") pattern was the basis of the typical medieval castle. Later castles were much bigger, with more rings of walls as much as 20 feet thick, once whitewashed and gleaming in the sun, flags flying high. Outside the wall was the moat, a ditch occasionally filled with water (they put alligators in them only in fairy tales). Edward I's castles were English islands in the middle of angry Wales. Most were built with a fortified grid-plan town attached and then filled with English settlers. If you want to visit some Welsh castle towns but don't have time for the whole region, head for North Wales, where my preferred home base is the town of Conwy. Built in the 1280s to give Edward I a toehold in Wales, it also served as a busy port, back when much of England was roofed with Welsh slate. 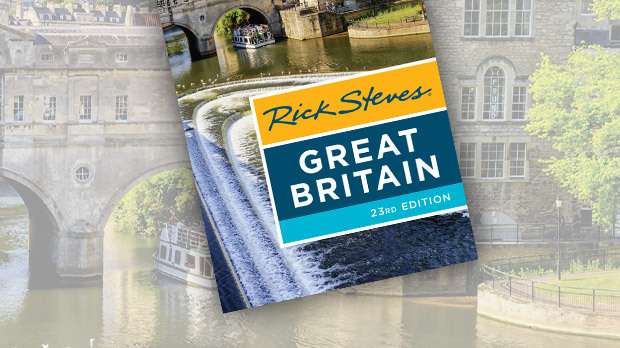 Today it boasts the best medieval walls in Britain, a protective castle dramatically situated on a rock overlooking the sea, and an appealing harborfront that locals treat like a town square. Conway is also home to what's billed as the "oldest house in Wales": Plas Mawr, the first Welsh home to be built within Conwy's English enclave. It was built in 1580, during the reign of Elizabeth I (Elizabeth's Tudor family had Welsh roots — and therefore relations between Wales and England warmed under her rule). For visitors, it offers a delightful look at 16th-century domestic life among the wealthy. Historically accurate (if facsimile) household items bring the rooms to life, as does the refreshing lack of velvet ropes — you're free to wander as you imagine life in this house. 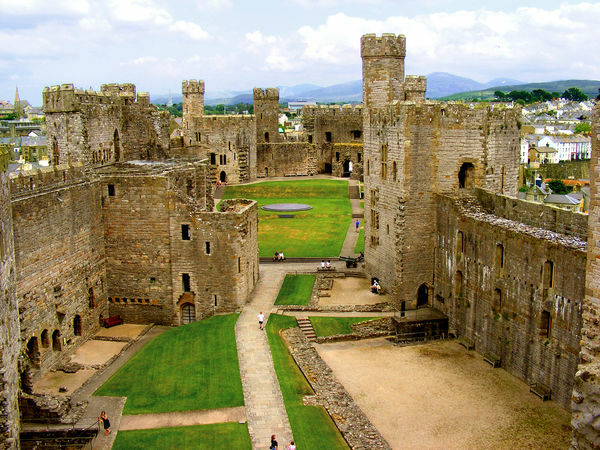 While Conwy oozes with Welsh charm, the most famous Welsh fortress is half an hour's drive away at Caernarfon Castle, where the last two Princes of Wales were invested. (An "investiture" is a royal ceremony similar to a coronation; Prince Charles had his in 1969.) Like Conwy, Caernarfon is an Edward I garrison town — the city still follows the original medieval grid plan laid within its well-preserved ramparts. Modeled after the striped, angular walls of ancient Constantinople, the castle, though impressive, was never finished and never really used. Despite its unfinished state, it's fun to climb around, especially its huge Eagle Tower. While the castle is late 13th century, Caernarfon is mostly a 19th-century town. At that time, the most important place in town was the area that sprawls below the castle (now a parking lot). This was once a booming slate port, shipping tidy bundles of slate from North Wales mining towns to ports all over Europe. While the slate trade is gone, Caernarfon still bustles with shops, cafés, and people, making this pleasant town worth a wander. For one of Britain's most beautiful castles, visit the romantic little village of Beaumaris on the Isle of Anglesey, about a 30-minute drive northeast from Caernarfon. Beaumaris originated, like other castle towns, as an English "green zone" in the 13th century, surrounded by Welsh guerrillas. Today, it feels genuinely Welsh, with a fine harborfront, lots of colorful shops and eateries, a fascinating Victorian prison (now a museum), and the remains of an idyllic castle. The site has no natural geological constraints like those that encumbered the castle designers at Caernarfon and Conwy, so its wall-within-a-wall design is almost perfectly concentric. 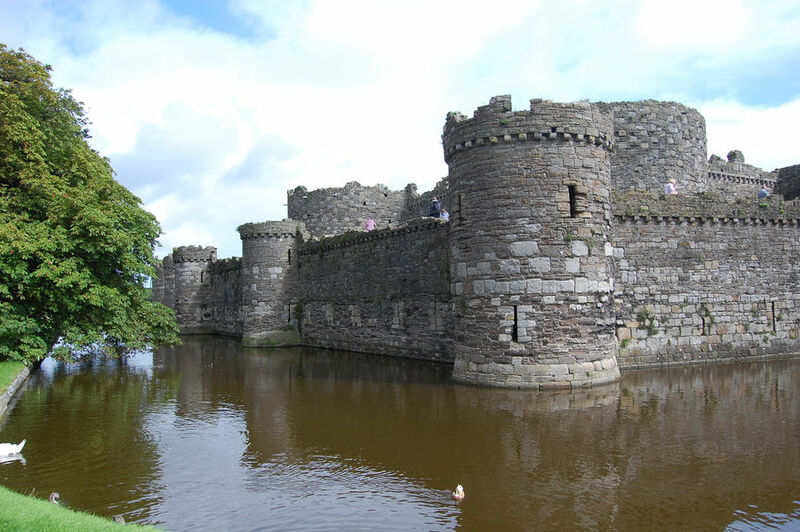 While Beaumaris shows medieval castle engineering at its best — four rings of defense, a moat, and a fortified dock — problems in Scotland changed the king's priorities before his vision could be completed. Construction stopped by 1330, and today it looks ruined (and rather squat) — but it was never ransacked or destroyed it's simply unfinished. The site was overgrown until the last century, when it was cleaned up to create a park-like space, with pristine lawns and a classic moat. Because it's harder to get here, it's less crowded, making your visit feel more authentic. Wales has a fierce loyalty to tradition and a distinct and thriving local culture. And, even with literally hundreds of once-fierce castles glaring down on any visitor, it offers among the warmest welcomes you'll find anywhere.